MUMBAI, India (CNN) -- The head of a small fishing community along the coast of Mumbai says he warned Indian police about terrorists smuggling powerful explosives months before gunmen entered through the harbor and launched a deadly siege against the city. 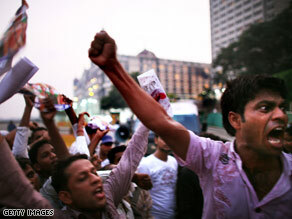 Angry demonstrators in Mumbai shout anti-Pakistan slogans on Wednesday. Based on information from the lone surviving gunman, six bombs were placed around Mumbai by the 10 attackers as they surged through India's financial capital last week, killing 179 and wounding hundred more. Two exploded in taxis in separate parts of the city during the attacks. After the siege ended, authorities found one bomb at the Oberoi hotel and two at the Taj Mahal -- the two luxury hotels where gunmen took hostages. On Wednesday, officials found another bomb at a train station but the timer device on the explosive was not active, said railway official K.P. Raghuvanshi. According to Indian officials, the attackers hijacked a trawler in the Pakistani port city of Karachi -- about 575 miles (925 km) north of Mumbai -- and came ashore at Mumbai in dinghies. The fisherman, Damoda Tandel, showed CNN a letter in which he warned Indian authorities about a tip that terrorists were using the harbor to import RDX, an explosive compound commonly used in military and industrial applications. He says police did nothing. Police say the information Tandel gave was too vague to act upon. Now, Tandel is angry and afraid, worried there could be more explosives planted around Mumbai -- though authorities say they believe all the bombs have been found. Still, the fisherman says the police could have prevented the gunmen from coming ashore by securing the harbor. Under pressure to explain the lapse of security that allowed the siege to occur, India has made clear that it believes the coordinated attacks in Mumbai originated in Pakistan. A police official leading the investigation says the attackers spent the past three months in Pakistan carefully planning their strike on India's financial capital. Mumbai Joint Police Commissioner of Crime Rakesh Maria said the information comes from his interview with the suspect in custody, who police say is the lone surviving attacker. Maria identified the suspect as Mohammed Ajmal Kasab, 21, from Faridkot village in the Okara district of Pakistan's Punjab province. He is the son of Mohammed Amir Kasab, the police commissioner said. Multiple law enforcement and intelligence sources familiar with the investigation said Kasab was put through a polygraph test and has also been interviewed by the FBI. Maria said all 10 attackers were Pakistanis, which Pakistani officials have denied, blaming instead "stateless actors." The band of gunmen attacked 10 targets in Mumbai on Wednesday night, sparking three days of battles with police and troops in the heart of the city that is the hub of India's financial and entertainment industries. Most of the deaths occurred at the city's top two hotels, The Oberoi and the Taj Mahal. Maria said Kasab spend the past 18 months training at various camps run by Lashkar-e-Tayyiba -- a Pakistan-based terror group allied with al Qaeda. Kasab told police he joined the group, known by its acronym LeT, six months before he began training. Pakistan banned LeT in 2002, after an attack on the Indian parliament that brought the nuclear rivals to the brink of war. The training primarily took place in the Kashmiri city of Muzaffarabad, Maria said. "He was told things like, 'You'll come in through this door, then go over here, then go out through that door,'" Maria told CNN. "Very, very detailed explicit instructions. The gunmen were hand-picked, but there were no examinations per se." All of the attackers were trained in Kashmir by former Pakistani army officers, but they apparently did not know each other. Kasab was trained to handle small arms as well as automatic weapons, the police commissioner said. He also received "explosives training, survival training, (and) nautical training." During the last three months of the training, which focused on the Mumbai strike, Kasab was "shown photographs of the locations he was to target," including one of the city's main railway stations and a hospital. Police have identified Kasab as the clean-shaven young man photographed in a black T-shirt carrying an assault rifle during the attack on Mumbai's Victoria Terminus train station, also known as Chhatrapati Shivaji Terminus (CST). Maria said Kasab joined LeT because he was poor, but he expressed surprise at how easily he was "brainwashed" into joining the terror group. LeT has denied any role in the attack. The only claim of responsibility has been in an e-mail -- which Indian police say originated in Pakistan -- from a previously unknown group calling itself the Deccan Mujahedeen. Maria said he thinks LeT used the name Deccan Mujahedeen because it operates illegally in Pakistan. He described the 21-year-old suspect as someone who would go unnoticed, with a criminal record in Pakistan for only petty theft. But he said Kasab is a cold-blooded killer. Kasab told police investigators that he shot a small boy and, because he was crying, "He shot him again, and killed him, to shut him up," Maria said. Kasab told the Indian investigators that the mission to strike Mumbai began on November 23 -- the Sunday before the attack -- when the attackers loaded a boat with their weapons, ammunition, and fake Indian identification documents, Maria said. A few days later, they hijacked a Pakistani fishing vessel near Indian international waters, and used that vessel to cover most of the approximately 500 nautical miles from Lahore, Pakistan, to Mumbai, he said. This account was confirmed by Mumbai's police chief in a news conference on Tuesday, who also cited the suspect's police interview. Maria said, according to Kasab's account, that the 10 attackers killed the captain and the crew, left them on the boat, and headed ashore in inflatable dinghies on Wednesday, the day of the attack. Asked if Kasab's testimony could be trusted, Maria said the suspect's description of the captain's body and the location of the attackers' satellite phone and global-positioning system matched what investigators found on the boat. "The dead captain lay in the front of the boat face down with his throat cut hands tied behind his back," Maria said. He also noted that the weapons used in the attack can be traced back to Pakistan. The police commissioner said the operation, as described by Kasab, was unique in its planning and execution -- not just in India, but worldwide. He said he expects Kasab to provide more details in his ongoing interrogation by Indian police, who have 90 days to charge him. They intend to charge Kasab with terrorism and seek the death penalty, which in India is carried out by hanging. They expect the whole process to take a year to 18 months. Maria said Kasab was not being tortured for answers.